Under its other name of Kilmurry Ibrickane, Mullagh Parish was administered with neighbouring Kilfarboy from the late seventeenth century until well into the nineteenth. The 1704 register lists one priest each for the two old parishes of Kilfarboy & Kilmurry Ibrickane, but there seems little doubt that these men, Frs. Teige and Francis Shannon, were respectively Parish Priest and Curate for the combined parish. By 1715, we find Fr. Francis Shannon officiating both in Kilfarboy and Kilmurry Ibrickane, as would all of his eighteenth century successors. By the late 1830’s the population of the combined parish had risen to about 20,000 souls and, probably in anticipation of a division, the parish priest and his curate, brothers Frs. Anthony and Patrick McGuane respectively, were at that time engaged in building near- identical churches at Mullagh and Miltown Malbay. On the death of Fr. Anthony in March 1839, Fr. 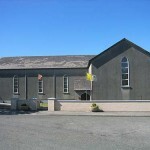 Patrick became Parish Priest of Miltown Malbay, leaving Fr. Edmund Patrick Barry, their grand-nephew as the first Parish Priest of Mullagh. Fr. Barry inherited a large rectangular church which Fr. Patrick McGuane had built or at least commenced. A tower and spire were projected but when the building was partially completed the “Big Wind” of 6th January 1839 knocked a large part of it. It was then completed without a tower or spire and a porch was added instead. Of the stones left over, a boundary wall and massive gate piers were constructed.